As a new business director, you've got to manage a lot of moving parts -- prospecting, relationship-building, managing pitches and RFPs, reporting, social media, etc. And for many people in this role, the only way they can survive the flurry of activity in the role is by using the right new business tools -- ones that simplify the person's task list and provide clarity when looking for relevant and actionable information. RSW/US and Mirren Business Development recently released their annual study of the top new business tools, outlining the resources agencies are using to connect with prospects, convert new business, and solidify relationships. Better integration of data: People want one tool that can manage all their activities. Better tracking: Tools need to integrate with other software platforms so that the data is accurate and up-to-date. Better reporting tools: New business directors wish that reporting on the metrics that actually matter for their role was easier and quicker. A simple, practical CRM: Many reported wanting a CRM that was easy to learn, has a user-friendly interface, and provides integration options with their marketing automation platform. The survey also covered agencies' use of a variety of tools including social media, social media monitoring, CRM, research services, prospecting and list building software, SEO, email marketing, marketing automation, and project management. A new category -- content development tools -- was added this year. 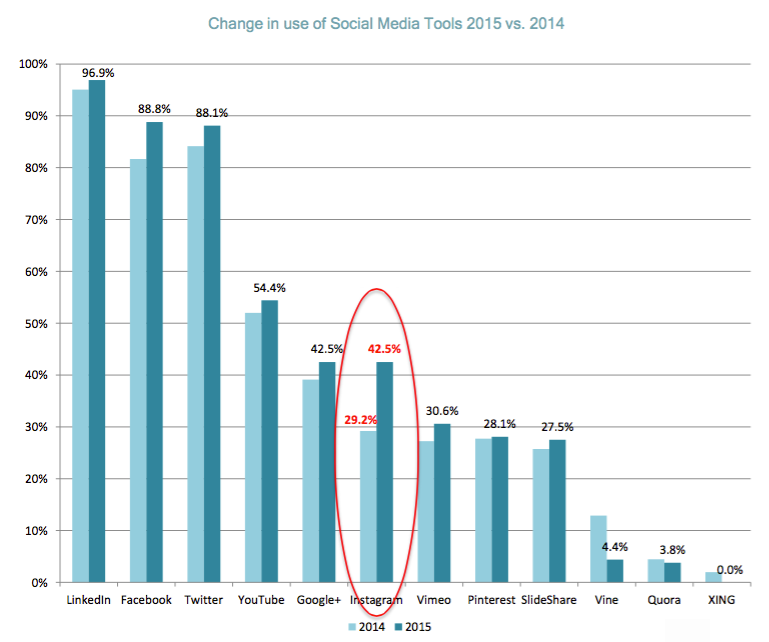 One interesting result was the change in use of social media tools during the past year. Agencies using Instagram as a marketing tool increased by 13%. 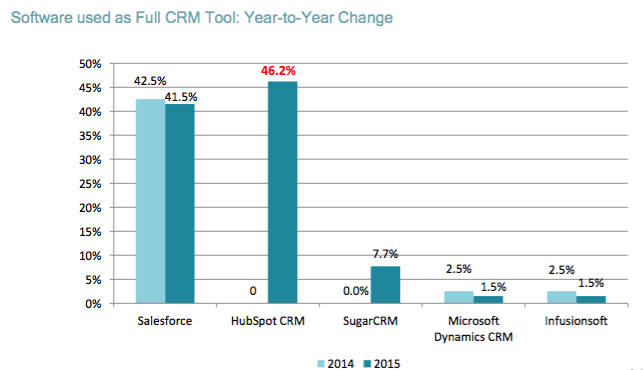 The use of a CRM is also on the rise -- up to 70% from 45% in 2013. 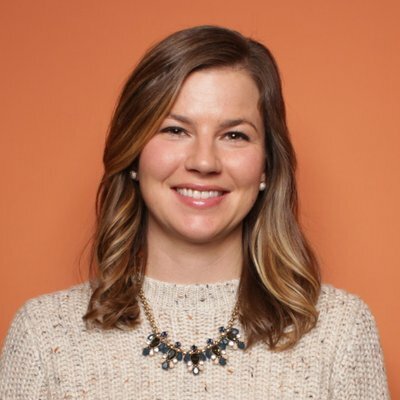 In addition, the landscape of CRM options has changed significantly in the past year, with HubSpot's free CRM making its mark on the results. One tool that saw a decline in usage was research. In 2013, 60% of agencies used research services, while in 2015, only 48.5% report using a consumer insight or client prospecting research tool. This could signal that more agencies are mining data on their own through web searches. Another area that is seeing a significant change is the prospecting and list building tools used by marketing agencies. 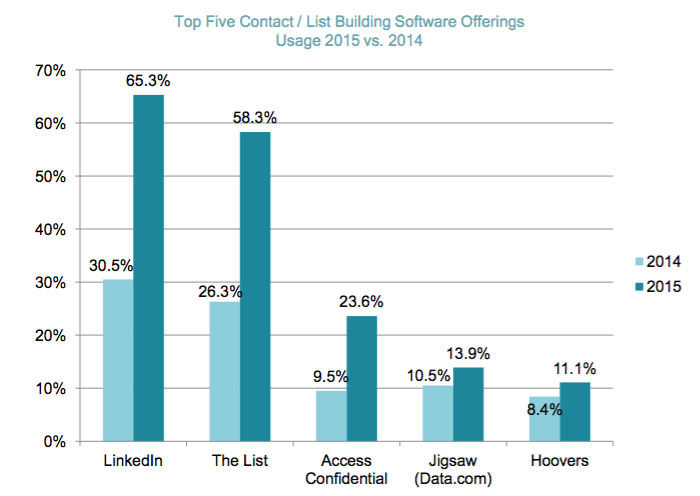 The List and LinkedIn, the later's Sales Navigator tool has quickly become a favorite for social selling, both saw significant growth in usage. What tools do you use for new business development? Let us know in the comments!